The Glidein Frontend (or VO frontend) will match user jobs with Glidein Factory ads. It is responsible for the submission of new glideins. The VO frontend also keeps part of the configuration of a glidein, and can also provide the glidein Factory with the pilot proxies. Note: This document refers to the tarball distribution of the Glidein Frontend. If you want to install or installed via RPM please refer to the OSG RMP Guide. This machine needs 4 cores, preferable no more than 2 years old and a moderate amount of memory (3GB plus 2MB per running job should be enough). Hardware requirements depend on the expected load. With small loads or for test purposes one core and 1GB will suffice. The installer requires a non-privileged user. This should be created prior to running the GlideinWMS installer. VO Frontend User(frontend) The Glidein Frontend should be installed as a non-privilged user. Note: It is recommended that you install HTCondor as this user as well. Note 1: In some places the installer will also ask for nicknames to go with the DNs. These nicknames are the HTCondor UIDs used in its configuration and mapfile (/etc/condor/certs/condor_mapfile). In the Frontend, these names can be arbitrary, are not related to unix accounts. When installing the Glidein Frontend you will need to specify the directory location for various items. We recommend putting most of them in /var. All the directories in /var have to be created as root. Therefore, if you intend on using /var, you will have to create the directories ahead of time. The Glidein Frontend will need the the HTCondor binaries. You can reuse an existing installation, if available, like if you host the Glidein Frontend on the a submitter node or on a submitter node. The installer can install a local copy as the same non privileged Glidein Frontend user. The whole process is managed by a install script described below. The Glidein Frontend needs a x509 proxy to communicate with the glidein Factory. You need to create such proxy before starting a VO Frontend and then keep it valid for the life of the Frontend (see here). If used for glidein submission (i.e. if it is passed to the glidein Factory), this proxy must at any point in time have a validity of at least the longest expected job being run by the GlideinWMS (and not less than 12 hours). The VO Frontend can also host the x509 proxies used for glidein submission. If you do use this (recommended) method, you need to keep these proxies valid at all times, as you do for the main Frontend proxy. The Glidein Frontend should be installed as a non privileged user. The provided installer will create the configuration file, although some manual tunning will probably be needed. 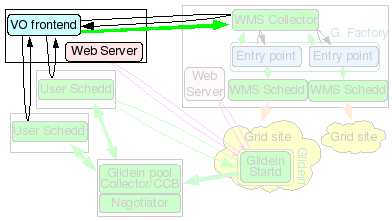 Before starting the installation of the Glidein Frontend make sure that the WMS Collector is started and running. The user collector and schedds should also be running. And execute the following. The installation of the Frontend should be done as the Frontend user (see username below). If this is a stand-alone VOFrontend install, only tarball installations are supported. hostname vofrontend.domain.name hostname for VOFrontend. .
username vofrontend (non-root account) UNIX user account that this services will run under. DO NOT use "root". For security purposes, this value should always be a non-root user. service_name vo_frontend Used as the 'nickname' for the GSI DN in the condor_mapfile. This name MUST correspond to Frontend service name listed the Factory configuration for the Frontend to be able to talk to the Factory. The install script will create this directory if it does exist. condor_location /path/to/condor-submit Directory in which the condor software will be installed. Note: The Frontend never runs any HTCondor daemons. It only uses the HTCondor client tools. IMPORTANT: The Frontend can share the same instance of HTCondor as the User Collector and /or Submit. The condor_location must not be a subdirectory of the Frontend's install_location or logs_dir. They may share the same parent, however. condor_tarball /path/to/condor/tarballs/condor-7.5.0-linux-x86-rhel3-dynamic.tar.gz Location of the condor tarball. The installation script will perform the installation of condor using this tarball. It must be a zipped tarball with a *.tg.tz name. x509_proxy /path-to-proxy/x509_proxyfile The location of the proxy used to identify this service to the other GlideinWMS services. 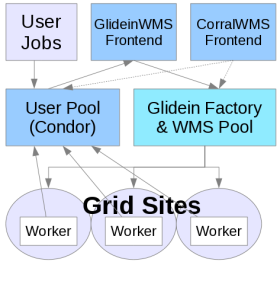 This is the only GlideinWMS service that currently requires a proxy to communicate with the other GlideinWMS services. This is NOT the glidein pilot proxy. The x509_gsi_dn option that follows should be populated with the issuer of this proxy. x509_gsi_dn dn-issuer-of-x509_proxy-using-openssl This is the identity used by this service to contact the other HTCondor based GlideinWMS services. This is the issuer of the proxy identified by the x509_proxy option above. glidein_proxy_files /path-to-proxy/proxyfile1 Identifies the proxy(s) to be used to submit the glidein pilot jobs. The Factory is expecting the VOFrontend to provide the glidein pilot proxies, at least one proxy must be specified. When specifying multiple proxies, whitespace is the delimiter. glidein_proxy_dns dn-issuer-of-glidein_proxy_files-using-openssl Identifies the issuer(s) of each proxy specified in the glidein_proxy_files option. This is the issuer of the proxy. (x509_cert option). Validation is performed based on the relative position of each entry in those options. This is used in the UserCollector condor_mapfile and condor_config.local so the glidein pilot can communicate with the UserCollector. When mulitple proxies are specified, a semicolon is the delimiter. * True - jobs will export shell variables to the user job running. * False - no shell variables will be exported. glideinwms_location /path/to/glideinWMS_code Directory of the GlideinWMS software. This software is used for both the installation and during the actual running of this glidein service. The same script can be used to stop, reconfig and restart the Glidein Frontend. Note: If you installed the Frontend via RPM some files or commands will differ. Please refer to the OSG RMP Guide. The files in the Frontend working directory must never be changed by hand after the directory structure has been created. Please notice that if you make any errors in the new configuration file, the reconfig script will throw an error and do nothing. If you executed the reconfig command while the Frontend was running, it will revert to the last config file and restart with those settings. As long as you use this tool, you should never corrupt the installation tree. NOTE: The reconfig tool does not kill the Frontend in case of errors. It is also recommended that you disable any groups that will not be used. Never remove them from the config file. The glidein Frontend supports the dynamic handling of downtimes. This script can allow you to have more control over managing downtimes.